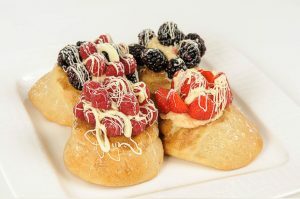 Home bakery Yummy Bakes NI has secured its first contract in Great Britain, supplying global catering giant Sodexo. The Newtownabbey business will supply its award-winning frozen shortbread biscuits to Sodexo for clients. The contract follows a pitch to Sodexo by Anna Taggart, Yummy Bakes NI founder and owner. The pitch was arranged by food consultancy Levercliff in Wrexham and followed extensive sampling and discussions with the key buyers lined up by Levercliff. According to Yummy Bakes, the product’s quality and ease in “baking off” – the product is supplied frozen and then baked by the customer – helped clinch the deal. “The new business is an immensely encouraging endorsement of the shortbread product,” Anna said. Established in 2012, Yummy Bakes has developed a strong customer base in Ireland for products include blast frozen dough for scones, cakes, biscuits and cookies. Over the past few years the company has won a series of awards from bodies such as the Guild of Fine Food, which runs the annual Great Taste Awards. The small business focuses on traditional baking techniques and uses family recipes handed down over four generations. All products are mixed and shaped by hand, instantly blast frozen and then supplied to the customer. One company told Anna her products had freed up over three hours of his chef’s time. “I blast freeze everything as soon as its made to keep it as fresh as it can be. It also means that the hotels and restaurants who buy the products can get that home-baked taste but with added convenience,” Anna said. Yummy Bakes NI produces almost 20,000 items a week with the help of one employee and uses Anna’s mother’s recipes. Her late mother ran a coffee shop on the Antrim Road in Belfast and passed on many of her recipes to her daughter. “People said now you’ve gone commercial you’re going to have to make these cheaper and use margarine but I always tell them that’ll never happen. For me it has to be the best it can and taste unlike what other companies are making so I’ll always use real butter and the best ingredients,” she said. Indeed, Anna’s products have been well received by critics. In the last four years, her shortbread has won seven awards and all 17 product lines have won Great Taste Awards. Currently, Yummy Bakes supplies cafes including O’Briens sandwich bars, Bob and Berts and Ramada Shaw’s Bridge, and to retail customers Henderson Group and other retailers.